Pew Research Center’s Portrait of Jewish Americans, its survey and analysis of American Jewish attitudes and beliefs, has emerged as THE topic of conversation in the Jewish world. Some celebrate the survey; some wring their hands over what it says about us Jewish Americans. The Union for Reform Judaism released a preliminary analysis for the Reform Movement. Most fascinating are questions about the religiosity or lack thereof of our Jewish brothers and sister. According to the study, only a slim majority of U.S. Jews say religion is very important (26%) or somewhat important (29%) in their lives. We might surmise that almost half of the Jews do not consider themselves religious. In a related category, we see that Jews are not significant worship service attenders. Roughly one-third of Jews (35%) say they attend religious services a few times a year, such as for the High Holidays (including Rosh Hashana and Yom Kippur). And four-in-ten say they seldom (19%) or never (22%) attend Jewish religious services. Similarly, those Jewish practices defined by the study – beyond the popular Passover Seder and, for some, fasting on Yom Kippur – do not attract significant adherents. Only a quarter of Jews (23%) say they always or usually light Sabbath candles, and a similar number say they keep kosher in their home (22%). Yes, it seems that a vast majority of U.S. Jews consider themselves “spiritual, but not religious.” Just what does this mean? I think spirituality is the sense that we are all part of something greater. Spirituality can lead to behaviors and thought-processes, which connect us with a larger reality. Spirituality can but does not necessarily include a connection to a higher power or divine. Now religion is a collection of beliefs, rituals, and prayers intended to help people retain a feeling of connection to an intensive spiritual encounter. 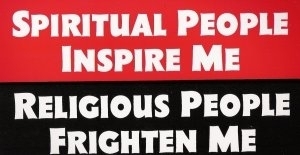 Religion aims to connect us with our spirituality. For Jews, our Torah teaches that generations ago, our people – the children of Israel, the Jewish people – had a spiritual encounter with the Holy One that embedded within us a clear sense of who we were and how we should live forevermore. Jewish rituals are intended to lead us back to the central experience of the Exodus from Egypt and our later spiritual encounter at Mt. Sinai. Jewish religious prayers return us to these spiritual events, as well as our arrival into the Promised Land, and our covenant with God. I don’t believe that God cares how big our sukkah is or how long we sound the tekiah gedolah on the shofar. Nor does God does ask us to separate out our women, to eschew the non-Jew, or to extend our power over others for so-called holy purposes. Of course, when religious leaders – rabbis, teachers, communal leaders – speak such nonsense in God’s name, they further alienate Jews from the religious part of Judaism that could be strengthening their spirituality. Rituals find meaning when they point us back to the holy, the spiritual. Rituals are significant when they inspire our spiritual core. It becomes the responsibility of religion – and religious leaders – then, to return to Judaism’s roots, to rethink/reform/renew Judaism’s ritual components, and to embrace the holy in the midst of the rest.